For more than a decade, investors have pumped cash into index funds and other passive investment vehicles, much to the dismay of active managers. The dollar amounts involved are staggering. As a result, the share prices of publicly traded active asset managers have struggled. 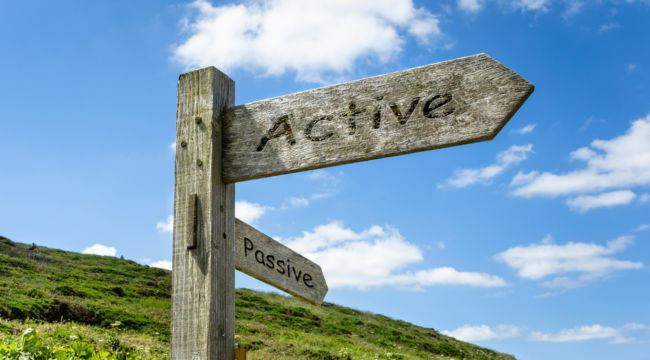 But what we all need to remember is that the popularity of passive and active investments is very cyclical. And this cycle is currently very, very long in the tooth. Since 2009, the percentage of cash invested in passive investment vehicles has soared, going from representing 25 percent of the market to 50 percent. All of this market share growth for passive investments has come at the expense of active managers. 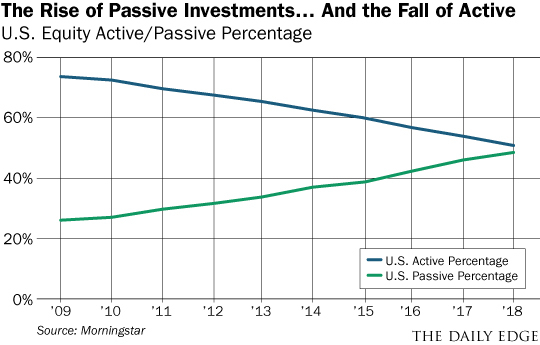 This is not the first time that passive investing has experienced a huge surge in popularity. The last time that we witnessed it was during the technology bubble in the late 1990s, when dollars flooded into index funds and ETFs that were dominated by soaring (and very risky) technology stocks — think of these risky stocks like the “FANGs” of their day. We all know how that ended… the tech bubble burst and the cycle turned hard. The result being that investors took their money out of risky passive investments and into value stocks to get far away from the “FANG stocks” of their day. This caused value stocks to massively outperform the market and the businesses of active asset managers to explode soon after (in a good way!). And you know what they say: History never repeats, but it often rhymes. I believe the turn back to value stocks is coming soon. And it is going to be very reminiscent of what we experienced at the turn of the century. Franklin Resources (BEN) is a value focused active asset manager which means the company is a perfect stock to buy now, before the cycle turns back to value. There are several reasons that I think Franklin Resources specifically is the right active value asset manager to buy today. First – Franklin Resources has a balance sheet to die for. The company currently has $6.5 billion in cash sitting on its balance sheet and zero debt. Second – The shares of Franklin Resources are dirt cheap. The current market capitalization (share price multiplied by the number of shares outstanding) of the company is $17.1 billion. If I subtract the $6.5 billion in cash that the company has, this means that the market is currently valuing the entire business as being worth $10.6 billion. With normalized net income of roughly $1.7 billion in each of the past three years, this means that Franklin Resources trades at just 6.2 times its $10.6 billion enterprise value to net income. That’s dirt cheap. Third – This business is generating a lot of excess cash flow and is returning a large amount of it to shareholders. The current dividend yield for Franklin Resources is 3.1 percent and the company has repurchased $3.5 billion worth of shares over the past three years. And it is doing this during a period of time when its active value focused style is out of favor. When the cycle turns, the cash being generated will only go up. Fourth – Forty percent of Franklin Resources shares are still owned by the Johnson family which founded the company in 1947. Greg Johnson, the son of the original founder, is still CEO and Chairman of the business. This is music to a value investor’s ears as this means that insiders are fully aligned with shareholders and are in this for the long-term. Fifth – A competitor, Oppenheimer Funds, was recently sold for a price that valued the company at 2.4% of total assets under management. Despite being a very similar business, Franklin Resources trades for just 1.5% of total assets under management, or only 60 percent of what the Oppenheimer deal suggests it should. And all of this is BEFORE the huge uplift in business that will come when the cycle turns back to value.